TOM TIVOL JEWELS > BLOG > Uncategorized > Gold Jewelry: Is It Real or Fake? 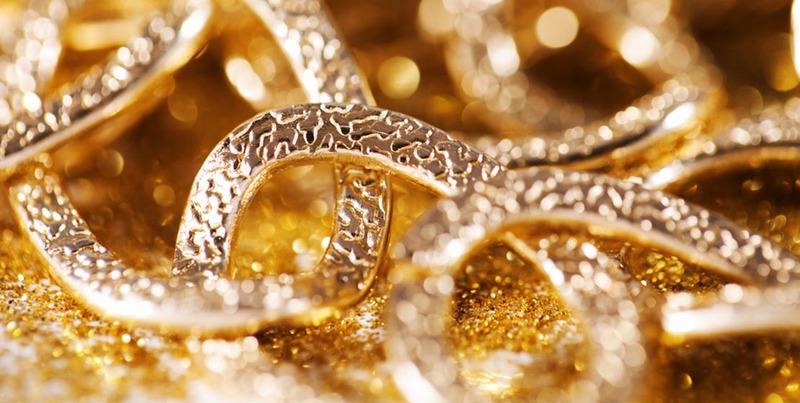 As the price of precious metals has risen the past 25 years, the resale of old gold jewelry and its subsequent refining by jewelers has become an important service offered by our industry. What do jewelers do to determine whether gold is real or fake? And if it is real, what do jewelers do to determine its karat content? Let’s make certain we all understand what gold is: Gold is a mineral found through mining and has been a source of tremendous wealth for several thousands of years. In some countries, like Greece, India and Thailand, pure 24k gold is cast, fabricated and forged into jewelry. These countries also alloy pure gold into 22k, 21k and 18k, making it a bit harder and more suitable for modern wear. Gold is mixed with other metals called alloys, like zinc and copper, and depending on the amount of gold compared to the amount of alloy, gold jewelry is then labeled a particular karat. As examples, 14k gold has 58.5% gold and the balance alloy. 18k gold has 75% gold and the balance alloy. Higher karat gold is most expensive while lower karat gold is both less expensive and harder. Lower karat gold like 9k, used frequently in 19th and 18th century English jewelry, often has a golden brown cast. If a piece is gold-filled, then there is a tiny amount of gold mixed inside with the alloys when the piece is manufactured. If the piece is gold-plated, then an ultra-thin chemical plating of gold is applied to the surface of the piece after it is manufactured. Many fine American pocket watches of the late 19th and 20th centuries are gold-filled. Much costume jewelry is gold-plated. Most countries in the 20th and 21st centuries have laws which require manufactured jewelry to be stamped with its metal content. This includes silver, gold, platinum and other metals. Not all countries require this. In addition, jewelers who custom design for their clients may or may not comply with these stamping laws. If the piece is stamped, as in 585 (the European stamp for 14k), in most cases, the gold is real and the karat content is accurate. In some instances, the gold is real but the karat content is not accurately stamped. This is termed “under-karating” and violates both state and federal law. As an example, if the piece is refined, the gold might be found to be 12.5 karat instead of 14k. In some instances, the stamp is completely counterfeit and the piece is gold-filled or gold-plated like most costume jewelry. To determine this with the greatest accuracy, using inexpensive and commonly available gold testing tools, the jeweler must file or saw into the metal deep enough to pierce any surface plating, and then apply acid and observe how the metal changes color. To do this on a customer’s piece, the jeweler should pick an area that is not obviously visible and of course the owner must give his/her permission. The modern jeweler also has available new tools that allow the jeweler to touch the piece with a “pointer,” and the karat content is digitally viewed on a screen. Even here though, to be absolutely certain, the metal should be filed and the pointer placed directly onto the filed edge. Ultimately, the most accurate information is discovered during the refining process. The best refineries offer jewelers a computer print out of the metals in any group of pieces, including gold and all the alloys the allow gold to be hardened and then used to make jewelry. The same rules apply to silver. Sterling silver is stamped 925 or sterl or sterling. If it is not stamped, it is extremely likely that it is NOT sterling. Lots of silver jewelry is manufactured with less silver and more alloy. Some of the pieces may be stamped 800, meaning 80% silver and 20% alloy. Absolutely pure silver jewelry is harder to find, but is occasionally available from certain designers. Pure silver is often used in the manufacture of commemorative coin-like stampings, which are frequently sold on late night TV. Flatware (place settings), are sterling if they show that stamp. If the sterling stamp cannot be found, the pieces are silver-plated. Gold-filled, gold-plated and silver-plated jewelry, flatware and objects of art are generally not accepted by refineries, as the cost of the process is greater than the amount of pure metal obtained. The great majority of the worlds’ jewelers check pieces which they purchase from manufacturers, and jewelers who take in precious metals from the public to refine will carefully check, usually by filing, while the customer observes. By far, the great majority of stamped jewelry in jewelry stores is accurately stated. When the public purchases gold jewelry in “out of the way” places, or sometimes on the internet, or under unusual circumstances, this is often where problems develop. Another way to say this is: if the purchase price is so unreasonably low, there is usually a reason for it. I just want to let you know that you were featured today in my article, [How to Identify Gold: 13 Ways Tell You If Gold Is Real and Avoid Fake Gold]. I’d be honored if you’d take a minute to visit. Thanks for all your effort making [https://tomtivoljewels.com/gold-jewelry-real-fake/] such a fantastic resource. I continue to be one of your biggest fans.